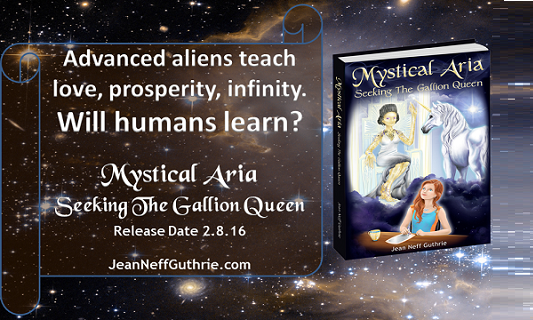 Why would Jean Neff Guthrie, author of Mystical Aria: Seeking the Gallion Queen, write about good aliens? Why not create emotion and tension with an alien force as the bad guys and a handsome hunk to save a lovely maiden from them? That’s too typical for this science fiction author. Jean needs someone to teach three young adults about love, infinity, and prosperity in an entertaining way. Thus she creates spiritually and technologically advanced aliens, the Gallions. What do Good Aliens Know? Jean doesn’t use a guru from India or Nobel Peace Prize winner to deliver messages about love, infinity, and prosperity. Humans, as a whole, struggle with living together in peace and connecting with each other in a loving way. Certain governments restrict freedoms and establish social structures that discourage people from reaching pinnacles of self-esteem. While parents typically want better lives for their children, no human generation collectively has mastered these skills to teach them to their children. Therefore, Jean looks to the stars for alien mentors who have learned about love, prosperity, and infinity from their ancestors. These good aliens become believable in this mystic story and, with a healthy dose of imagination, open the youngsters’ hearts to concepts that encourage them make positive choices for a more peaceful world. Long ago the Gallion ancestors instilled a sense of loyalty and duty by strengthening the soul and its destiny. They wondered why they were born. Why they chose certain paths. Why they met other species. They considered themselves lost without understanding their purpose. Gallions observe other life-forms and explore planets with the intent to connect, not dominate. They believe that the One Provider creates all life in divine harmony, and so all life-forms should live that way. Certainly, other worlds have attempted to capture the Gallions, destroy their land, or even blow up their planet. With their superior technology and mindful shielding, the Gallions have thwarted all enemies during the past three thousand years. Guthrie dreams of an Earth generation that knows no war. She aspires to write mystic stories with messages that trigger a shift in young adults to choose love over fear. In Mystical Aria: Seeking the Gallion Queen, lessons of love, prosperity, and infinity come from Gallions. The good aliens. Jean Neff Guthrie is the author of Mystical Aria: Seeking the Gallion Queen, which hit Amazon #1 Best Seller February, 2016. Visit www.JeanNeffGuthrie.com for novel highlights and purchase. Click here for VIP Access to Aria, which includes two free chapters, character map, promotions, news, fun facts, and more.